Brush charm. The Gorgeous Horse is your source for custom equestrian jewelry. 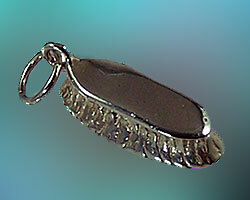 Check out another one of our cool charms, it would look great on any charm bracelet. Be sure to check out all of our other charms. All our pendants are offered in your choice of gold or silver.